The Environment Bug was sitting on the dock enjoying the fresh air. Every once in a while a nice big trout would jump out of the lake. Environment Bug loved it. He was enjoying himself very much. All of a sudden, the Environment Bug saw a shadow behind him. He then heard a kerplunk sound. He saw a tin can floating on top of the water. He turned just in time to see a young boy trying to kick another can in the water. 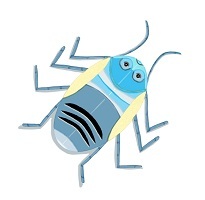 “Do you realize that you can hurt the fish that are in the water?” asked the Environment Bug. Just then the Environment Bug saw a fish swim straight for the can. Environment Bug jumped into the water. It was too late. The fish swam right into the can. “Oh dear!” exclaimed the Environment Bug, grabbing onto the can and pulling it with all his might. The young boy helped the Environment Bug to shore. The Environment Bug put his hand inside the can and very carefully pulled the fish out without cutting either himself or the fish. He looked the fish over very carefully and after seeing that the fish was okay he handed it to the boy. The young boy took the fish to the waters edge and let it go back into the water. “I’m so sorry,” said the young boy a few minutes later. Throwing items into the water isn’t a good idea. Example: A young boy was caught kicking cans into the water and a fish got caught in one of them. This entry was posted in Environment Bug Stories, Grade 4 Level and tagged Environment Bug, fish, friend, Kick the Can, Shadow. Bookmark the permalink.